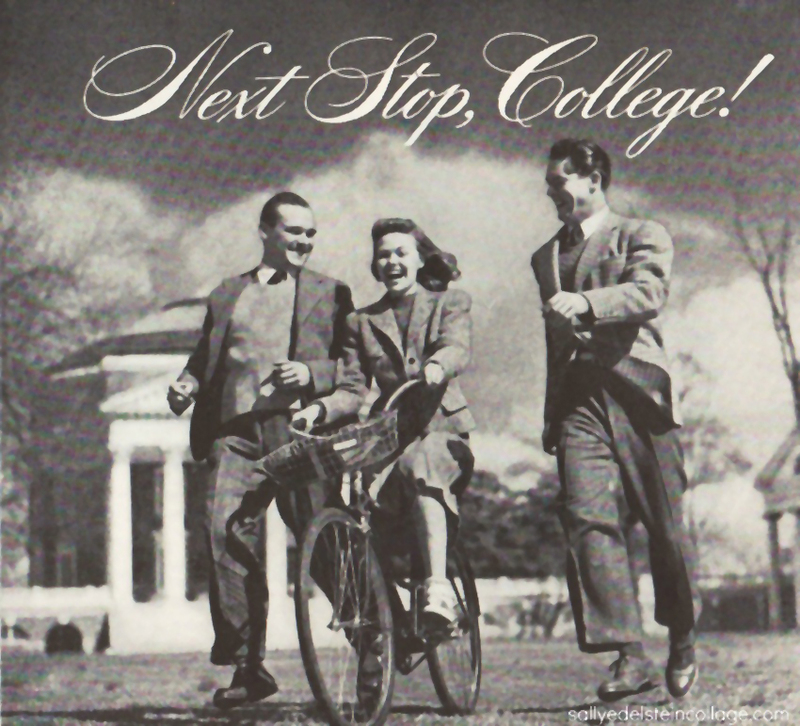 By 1947 the shape of college campuses all across the country were being altered. 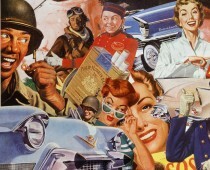 Through his financial assistance Uncle Sam brought a college education to within reach of millions of persons who otherwise would have gone directly into trades or blue-collar jobs. Now, a sheepskin diploma was one more component of that American Dream. The Veterans Administration paid the university up to $500 a year for tuition, books and other training costs and vets received a small allowance while in school. 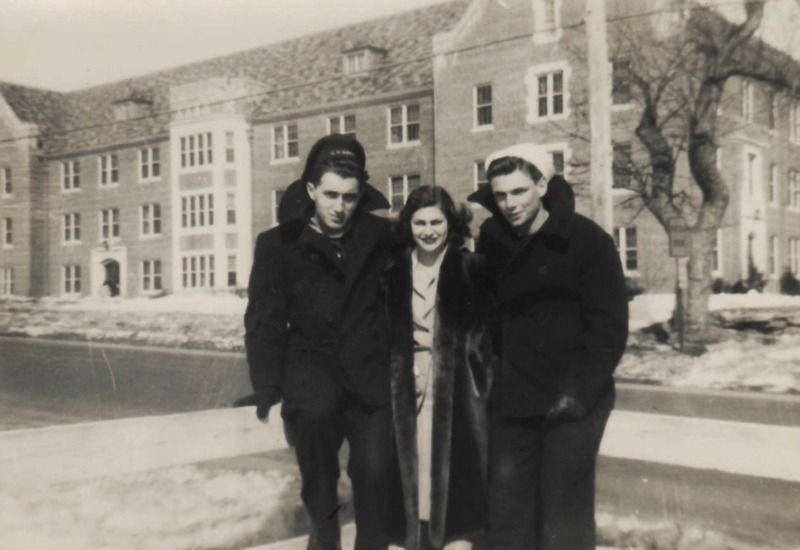 Armies of American veterans were streaming into colleges, their little gold discharge buttons winking gaily from their coat lapels, wedging themselves into colleges which hadn’t done any building since 1941. The results were like trying to pack 2 pounds of sardines into a 1 pound tin. The changes they brought were visible, as trailer camps, Quonset huts and rows of temporary barracks were set up on campus. Classrooms were so crowded that classes started at 7:30 and lasted till 10:30 at night. Barely able to catch their breath, it was the biggest and most sudden impact American higher education had ever received; the arrival in force on the campuses of 1,777,000 war veterans, made them 50% of the total college population. These new students were often above average in grades and educators lamented a return to the old system. The returning vets were a welcome sight to Betty Coed and to my mother Betty a college sophomore at the University of Connecticut. G-I ( guy interest) was the theme song of colleges now. That guy who was someone nice to send letters too last year was now back in your college life. It was a different campus than the male deprived war years. The absence of an entire generation of men between the ages of 17 and 30 left a lonely void. Even though she and her crowd of girls enjoyed playing bridge and having hen parties to fill up those lonely weekends, Betty couldn’t help wondering if they were not rationing love too. 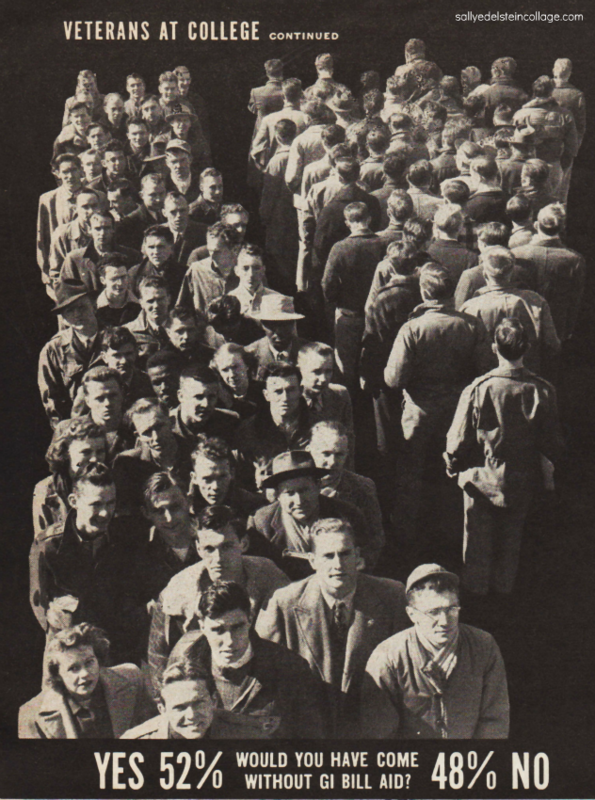 During the war years you had to take what you could get, including men, but by 1947 the colleges all over America were being filled by a boatload of eligible men- literally a battalion of returning soldiers taking advantage of the GI Bill. The shapes of college campuses were being altered all across the county impacting previously enrolled students as well. 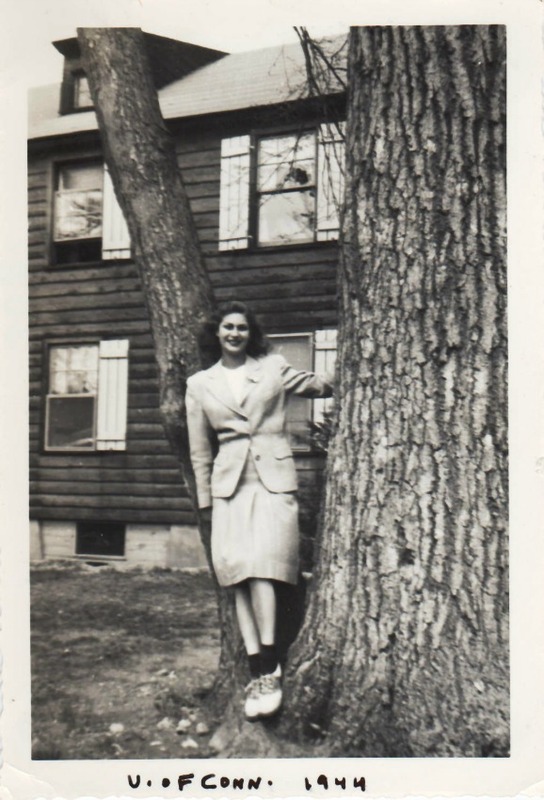 A New Yorker, my mother Betty found herself dislocated along with millions of other college students in the post-war chaos of overcrowded schools. The University of Connecticut like so many swollen schools had to eventually close their doors to out-of-state students to accommodate the swell of new GI enrollment. Branded as “out of staters” they were forced out, leaving a downcast Betty to feel as uprooted as the millions of displaced persons in Europe wandering from place to place. Sadly she joined the millions of dejected displaced students pouring out of former Alma maters until they could find a college that would accept them. Schools themselves were changing, becoming West Points for Big Business. Fresh from the war the boys had one strategy they wanted to be deployed directly into jobs as second lieutenants with US Steel or Du Pont. And retire comfortably on a Colonels pension forty years later. Corporations from coast to coast quickly filled with forward thinking vets who traded in their khaki uniform for a grey flannel one. With a firm handshake , they enlisted for life, the golden carrot of retirement loomed in the future like a pot of gold at the end of the work world rainbow. I suppose considering the extreme hardships and danger they endured during their service overseas, these fighting men deserved every opportunity that came their way. And they were very fortunate to emerge from college during a booming economy too. Man that guy’s underwear in the last pic is as dorky as can be! i find it very interesting the children and grand children of these men often end up opposing the very programs that helped to bring their family into the middle class and, in case of some, the upper class. A lot of people don’t see these programs for what they are: investments in the future. One of the reasons the United States has not had the kind of violent revolutions that have occurred in a lot countries is that we have found ways to provide the opportunity for upward mobility.